Proprietary Name: Etomidate What is the Proprietary Name? Non-Proprietary Name: Etomidate What is the Non-Proprietary Name? Etomidate with NDC 67457-902 is a a human prescription drug product labeled by Mylan Institutional Llc. The generic name of Etomidate is etomidate. The product's dosage form is injection, solution and is administered via intravenous form. FDA Application Number: ANDA201044 What is the FDA Application Number? Etomidate Injection, USP is a sterile, nonpyrogenic solution. Each milliliter contains etomidate, 2 mg, propylene glycol 35% v/v. 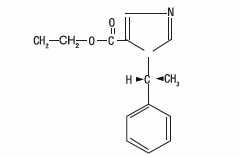 The pH is 6.0 (4.0 to 7.0).It is intended for the induction of general anesthesia by intravenous injection.The drug etomidate is chemically identified as (R)-(+)-ethyl-1-(1-phenylethyl)-1H-imidazole-5-carboxylate and has the following structural formula:Molecular Formula of Etomidate is C14H16N2O2 and its Molecular Weight is 244.3. Etomidate is a general anesthetic without analgesic activity. Intravenous injection of etomidate produces anesthesia characterized by a rapid onset of action, usually within one minute. Duration of anesthesia is dose dependent but relatively brief, usually three to five minutes when an average dose of 0.3 mg/kg is employed. Immediate recovery from anesthesia (as assessed by awakening time, time needed to follow simple commands and time to perform simple tests after anesthesia as well as they were performed before anesthesia), based upon data derived from short operative procedures where intravenous etomidate was used for both induction and maintenance of anesthesia, is about as rapid as, or slightly faster than, immediate recovery after similar use of thiopental. These same data revealed that the immediate recovery period will usually be shortened in adult patients by the intravenous administration of approximately 0.1 mg of intravenous fentanyl, one or two minutes before induction of anesthesia, probably because less etomidate is generally required under these circumstances (consult the package insert for fentanyl before using).The most characteristic effect of intravenous etomidate on the respiratory system is a slight elevation in arterial carbon dioxide tension (PaCO2) (see ADVERSE REACTIONS). Reduced cortisol plasma levels have been reported with induction doses of 0.3 mg/kg etomidate. These persist for approximately 6 to 8 hours and appear to be unresponsive to ACTH administration. The intravenous administration of up to 0.6 mg/kg of etomidate to patients with severe cardiovascular disease has little or no effect on myocardial metabolism, cardiac output, peripheral circulation or pulmonary circulation. The hemodynamic effects of etomidate have in most cases been qualitatively similar to those of thiopental sodium, except that the heart rate tended to increase by a moderate amount following administration of thiopental under conditions where there was little or no change in heart rate following administration of etomidate. However, clinical data indicates that etomidate administration in geriatric patients, particularly those with hypertension, may result in decreases in heart rate, cardiac index, and mean arterial blood pressure. There are insufficient data concerning use of etomidate in patients with recent severe trauma or hypovolemia to predict cardiovascular response under such circumstances. Clinical experience and special studies to date suggest that standard doses of intravenous etomidate ordinarily neither elevate plasma histamine nor cause signs of histamine release. Limited clinical experience, as well as animal studies, suggests that inadvertent intra-arterial injection of etomidate, unlike thiobarbiturates, will not usually be followed by necrosis of tissue distal to the injection site. Intra-arterial injection of etomidate is, however, not recommended. Etomidate induction is associated with a transient 20% to 30% decrease in cerebral blood flow. This reduction in blood flow appears to be uniform in the absence of intracranial space occupying lesions. As with other intravenous induction agents, reduction in cerebral oxygen utilization is roughly proportional to the reduction in cerebral blood flow. In patients with and without intracranial space occupying lesions, etomidate induction is usually followed by a moderate lowering of intracranial pressure, lasting several minutes. All of these studies provided for avoidance of hypercapnia.Information concerning regional cerebral perfusion in patients with intracranial space occupying lesions is too limited to permit definitive conclusions. Preliminary data suggests that etomidate will usually lower intraocular pressure moderately. Etomidate is rapidly metabolized in the liver. Minimal anesthetic plasma levels of unchanged drug are equal to or higher than 0.23 mcg/mL; they decrease rapidly up to 30 minutes following injection and thereafter more slowly with a half-life value of about 75 minutes. Approximately 75% of the administered dose is excreted in the urine during the first day after injection. The chief metabolite is R-(+)-1-(1-phenylethyl)- 1H-imidazole-5-carboxylic acid, resulting from hydrolysis of etomidate, and accounts for about 80% of the urinary excretion. Limited pharmacokinetic data in patients with cirrhosis and esophageal varices suggest that the volume of distribution and elimination half-life of etomidate are approximately double that seen in healthy subjects. In clinical studies, elderly patients demonstrated decreased initial distribution volumes and total clearance of etomidate. Protein binding of etomidate to serum albumin was also significantly decreased in these individuals. Reduced plasma cortisol and aldosterone levels have been reported following induction doses of etomidate. These results persist for approximately 6 to 8 hours and appear to be unresponsive to ACTH stimulation. This probably represents blockage of 11 beta-hydroxylation within the adrenal cortex. Etomidate injection is indicated by intravenous injection for the induction of general anesthesia. When considering use of etomidate injection, the usefulness of its hemodynamic properties (see CLINICAL PHARMACOLOGY) should be weighed against the high frequency of transient skeletal muscle movements (see ADVERSE REACTIONS). Intravenous etomidate injection is also indicated for the supplementation of subpotent anesthetic agents, such as nitrous oxide in oxygen, during maintenance of anesthesia for short operative procedures such as dilation and curettage or cervical conization. INTRAVENOUS ETOMIDATE SHOULD BE ADMINISTERED ONLY BY PERSONS TRAINED IN THE ADMINISTRATION OF GENERAL ANESTHETICS AND IN THE MANAGEMENT OF COMPLICATIONS ENCOUNTERED DURING THE CONDUCT OF GENERAL ANESTHESIA. BECAUSE OF THE HAZARDS OF PROLONGED SUPPRESSION OF ENDOGENOUS CORTISOL AND ALDOSTERONE PRODUCTION, THIS FORMULATION IS NOT INTENDED FOR ADMINISTRATION BY PROLONGED INFUSION. Pediatric Neurotoxicity: Published animal studies demonstrate that the administration of anesthetic and sedation drugs that block NMDA receptors and/or potentiate GABA activity increase neuronal apoptosis in the developing brain and result in long-term cognitive deficits when used for longer than 3 hours. The clinical significance of these findings is not clear. However, based on the available data, the window of vulnerability to these changes is believed to correlate with exposures in the third trimester of gestation through the first several months of life, but may extend out to approximately three years of age in humans (see PRECAUTIONS/Pregnancy, Pediatric Use, ANIMAL PHARMACOLOGY AND/OR TOXICOLOGY). Some published studies in children suggest that similar deficits may occur after repeated or prolonged exposures to anesthetic agents early in life and may result in adverse cognitive or behavioral effects. These studies have substantial limitations, and it is not clear if the observed effects are due to the anesthetic/sedation drug administration or other factors such as the surgery or underlying illness. Anesthetic and sedation drugs are a necessary part of the care of children needing surgery, other procedures, or tests that cannot be delayed, and no specific medications have been shown to be safer than any other. Decisions regarding the timing of any elective procedures requiring anesthesia should take into consideration the benefits of the procedure weighed against the potential risks. Carcinogenesis Long-term animal studies to evaluate the carcinogenic potential of etomidate have not been completed. Mutagenesis Studies to evaluate the mutagenic potential of etomidate have not been completed. Impairment of Fertility In a fertility and early embryonic development study in which male and female rats were treated intravenously with 0.31, 1.25, and 5 mg/kg/day etomidate (0.17, 0.68, and 2.7 times the human induction dose of 0.3 mg/kg based on body surface area) prior to mating, no adverse effects on fertility were noted. Risk Summary There are no adequate and well-controlled studies in pregnant women. In animal reproduction studies, fetal deaths and reduced pup survival were noted after intravenous administration of etomidate to pregnant rats at doses 0.17 times the human induction dose of 0.3 mg/kg. Reduced pup survival was noted after intravenous administration of etomidate to pregnant rabbits at 1.6 times the human induction dose. Published studies in pregnant primates demonstrate that the administration of anesthetic and sedation drugs that block NMDA receptors and/or potentiate GABA activity during the period of peak brain development increases neuronal apoptosis in the developing brain of the offspring when used for longer than 3 hours. There are no data on pregnancy exposures in primates corresponding to periods prior to the third trimester in humans. [See Data] The estimated background risk of major birth defects and miscarriage for the indicated population is unknown. All pregnancies have a background risk of birth defect, loss, or other adverse outcomes. In the U.S. general population, the estimated background risk of major birth defects and miscarriage in clinically recognized pregnancies is 2% to 4% and 15% to 20%, respectively.Data Animal Data No malformations or adverse fetal effects were noted in a study in which pregnant rats were intravenously administered 0.31, 1.25, or 5 mg/kg/day etomidate (0.17, 0.68, or 2.7 times the human induction dose of 0.3 mg/kg based on body surface area) during organogenesis (Gestation Days 6-15). Reduced pup survival was noted in all doses tested in a study in which pregnant rabbits were intravenously administered 1.5 or 4.5 mg/kg/day etomidate (1.6 or 4.9 times the human induction dose of 0.3 mg/kg based on body surface area) during organogenesis (Gestation Day 6-18). These doses also produced maternal toxicity (increased mortality). Increased still born fetuses and decreased pup survival was noted at all doses tested in a study where pregnant rats were intravenously administered 0.31, 1.25, or 5 mg/ kg/day etomidate (0.17, 0.68, or 2.7 times the human induction dose of 0.3 mg/kg based on body surface area) during gestation and throughout lactation (Gestation Day 16 through Lactation Day 21). These doses also produced maternal toxicity (decreased food consumption and increased mortality). In this study, offspring were not evaluated for sexual maturation, neurobehavioral function including learning and memory, or reproductive function. In a published study in primates, administration of an anesthetic dose of ketamine for 24 hours on Gestation Day 122 increased neuronal apoptosis in the developing brain of the fetus. In other published studies, administration of either isoflurane or propofol for 5 hours on Gestation Day 120 resulted in increased neuronal and oligodendrocyte apoptosis in the developing brain of the offspring. With respect to brain development, this time period corresponds to the third trimester of gestation in the human. The clinical significance of these findings is not clear; however, studies in juvenile animals suggest neuroapoptosis correlates with long-term cognitive deficits (See WARNINGS/ Pediatric Neurotoxicity, PRECAUTIONS/Pregnancy, ANIMAL TOXICOLOGY AND/OR PHARMACOLOGY). There are inadequate data for etomidate to make dosage recommendations for induction of anesthesia in patients below the age of ten (10) years; therefore, such use is not recommended (see also DOSAGE AND ADMINISTRATION). Published juvenile animal studies demonstrate that the administration of anesthetic and sedation drugs, such as etomidate, that either block NMDA receptors or potentiate the activity of GABA during the period of rapid brain growth or synaptogenesis, results in widespread neuronal and oligodendrocyte cell loss in the developing brain and alterations in synaptic morphology and neurogenesis. Based on comparisons across species, the window of vulnerability to these changes is believed to correlate with exposures in the third trimester of gestation through the first several months of life, but may extend out to approximately 3 years of age in humans.In primates, exposure to 3 hours of ketamine that produced a light surgical plane of anesthesia did not increase neuronal cell loss, however, treatment regimens of 5 hours or longer of isoflurane increased neuronal cell loss. Data from isoflurane-treated rodents and ketamine-treated primates suggest that the neuronal and oligodendrocyte cell losses are associated with prolonged cognitive deficits in learning and memory. The clinical significance of these nonclinical findings is not known, and healthcare providers should balance the benefits of appropriate anesthesia in pregnant women, neonates, and young children who require procedures with the potential risks suggested by the nonclinical data. (See WARNINGS/Pediatric Neurotoxicity, PRECAUTIONS/ Pregnancy, and ANIMAL PHARMACOLOGY AND/OR TOXICOLOGY) Geriatric Use: Clinical data indicates that etomidate may induce cardiac depression in elderly patients, particularly those with hypertension (see CLINICAL PHARMACOLOGY and OTHER ADVERSE OBSERVATIONS, Circulatory System). Elderly patients may require lower doses of etomidate than younger patients. Age-related differences in pharmacokinetic parameters have been observed in clinical studies (see CLINICAL PHARMACOLOGY and DOSAGE AND ADMINISTRATION). This drug is known to be substantially excreted by the kidney, and the risk of toxic reactions to this drug may be greater in patients with impaired renal function. Because elderly patients are more likely to have decreased renal function, care should be taken in dose selection and it may be useful to monitor renal function. Plasma Cortisol Levels: Induction doses of etomidate have been associated with reduction in plasma cortisol and aldosterone concentrations (see CLINICAL PHARMACOLOGY). These have not been associated with changes in vital signs or evidence of increased mortality; however, where concern exists for patients undergoing severe stress, exogenous replacement should be considered. Effect of anesthetic and sedation drugs on early brain development Studies conducted in young animals and children suggest repeated or prolonged use of general anesthetic or sedation drugs in children younger than 3 years may have negative effects on their developing brains. Discuss with parents and caregivers the benefits, risks, and timing and duration of surgery or procedures requiring anesthetic and sedation drugs. (See WARNINGS/Pediatric Neurotoxicity). The most frequent adverse reactions associated with use of intravenous etomidate are transient venous pain on injection and transient skeletal muscle movements, including myoclonus: •Transient venous pain was observed immediately following intravenous injection of etomidate in about 20% of the patients, with considerable difference in the reported incidence (1.2% to 42%). This pain is usually described as mild to moderate in severity but it is occasionally judged disturbing. The observation of venous pain is not associated with a more than usual incidence of thrombosis or thrombophlebitis at the injection site. Pain also appears to be less frequently noted when larger, more proximal arm veins are employed and it appears to be more frequently noted when smaller, more distal, hand or wrist veins are employed. •Transient skeletal muscle movements were noted following use of intravenous etomidate in about 32% of the patients, with considerable difference in the reported incidence (22.7% to 63%). Most of these observations were judged mild to moderate in severity but some were judged disturbing. The incidence of disturbing movements was less when 0.1 mg of fentanyl was given immediately before induction. These movements have been classified as myoclonic in the majority of cases (74%), but averting movements (7%), tonic movements (10%), and eye movements (9%) have also been reported. No exact classification is available, but these movements may also be placed into three groups by location: •Most movements are bilateral. The arms, legs, shoulders, neck, chest wall, trunk and all four extremities have been described in some cases, with one or more of these muscle groups predominating in each individual case. Results of electroencephalographic studies suggest that these muscle movements are a manifestation of disinhibition of cortical activity; cortical electroencephalograms, taken during periods when these muscle movements were observed, have failed to reveal seizure activity. •Other movements are described as either unilateral or having a predominance of activity of one side over the other. These movements sometimes resemble a localized response to some stimuli, such as venous pain on injection, in the lightly anesthetized patient (averting movements). Any muscle group or groups may be involved, but a predominance of movement of the arm in which the intravenous infusion is started is frequently noted. •Still other movements probably represent a mixture of the first two types.Skeletal muscle movements appear to be more frequent in patients who also manifest venous pain on injection. Respiratory System: Hyperventilation, hypoventilation, apnea of short duration (5 to 90 seconds with spontaneous recovery); laryngospasm, hiccup and snoring suggestive of partial upper airway obstruction have been observed in some patients. These conditions were managed by conventional countermeasures. Circulatory System: Hypertension, hypotension, tachycardia, bradycardia and other arrhythmias have occasionally been observed during induction and maintenance of anesthesia. One case of severe hypotension and tachycardia, judged to be anaphylactoid in character, has been reported. Geriatric patients, particularly those with hypertension, may be at increased risk for the development of cardiac depression following etomidate administration (see CLINICAL PHARMACOLOGY). Gastrointestinal System: Postoperative nausea and/or vomiting following induction of anesthesia with etomidate is probably no more frequent than the general incidence. When etomidate was used for both induction and maintenance of anesthesia in short procedures such as dilation and curettage, or when insufficient analgesia was provided, the incidence of postoperative nausea and/or vomiting was higher than that noted in control patients who received thiopental. To report SUSPECTED ADVERSE REACTIONS, contact Mylan Pharmaceuticals Inc. at 1-877-446-3679 (1-877-4-INFO-RX) or FDA at 1-800-FDA-1088 or www.fda. gov/medwatch. Overdosage may occur from too rapid or repeated injections. Too rapid injection may be followed by a fall in blood pressure. No adverse cardiovascular or respiratory effects attributable to etomidate overdose have been reported.In the event of suspected or apparent overdosage, the drug should be discontinued, a patent airway established (intubate, if necessary) or maintained and oxygen administered with assisted ventilation, if necessary. Do not administer unless solution is clear and container is undamaged. Discard unused portion (see DOSAGE AND ADMINISTRATION). Etomidate injection is intended for administration only by the intravenous route (see CLINICAL PHARMACOLOGY). The dose for induction of anesthesia in adult patients and in pediatric patients above the age of ten (10) years will vary between 0.2 mg/kg and 0.6 mg/kg of body weight, and it must be individualized in each case. The usual dose for induction in these patients is 0.3 mg/kg, injected over a period of 30 to 60 seconds. There are inadequate data to make dosage recommendations for induction of anesthesia in patients below the age of ten (10) years; therefore, such use is not recommended. Geriatric patients may require reduced doses of etomidate. Smaller increments of intravenous etomidate may be administered to adult patients during short operative procedures to supplement subpotent anesthetic agents, such as nitrous oxide. The dosage employed under these circumstances, although usually smaller than the original induction dose, must be individualized. There are insufficient data to support this use of etomidate for longer adult procedures or for any procedures in pediatric patients; therefore, such use is not recommended. The use of intravenous fentanyl and other neuroactive drugs employed during the conduct of anesthesia may alter the etomidate dosage requirements. Consult the prescribing information for all other such drugs before using. Premedication: Etomidate injection is compatible with commonly administered pre-anesthetic medications, which may be employed as indicated. See also CLINICAL PHARMACOLOGY, ADVERSE REACTIONS, and dosage recommendations for maintenance of anesthesia. Etomidate anesthesia does not significantly alter the usual dosage requirements of neuromuscular blocking agents employed for endotracheal intubation or other purposes shortly after induction of anesthesia. Parenteral drug products should be inspected visually for particulate matter and discoloration prior to administration, whenever solution and container permit. To prevent needle-stick injuries, needles should not be recapped, purposely bent, or broken by hand.